Hello! Well I know that it's absolutely been too long since I've taken on a card challenge, that's for sure! I'm quite sure I never would have gone for a purple ocean floor, but I have to say now that I see it, I wouldn't want it any other color. Just love that about challenges!! The current Ellen Hutson June Color Trend Challenge was easy from the standpoint that these are already all the colors I've been crushing on in the last couple months. 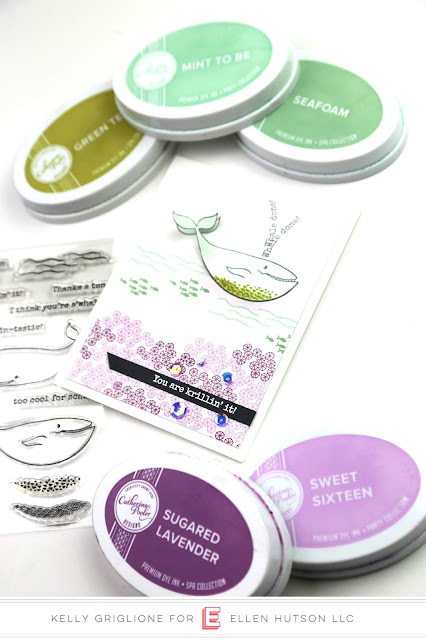 Someone would have to pry Catherine Pooler's Mint to Be and Green Tea from my hands when I'm at the crafting table. And I'm quite sure there would be a struggle. An epic struggle : ) I've also been into combining them with purple, which is the Pantone color of the year for 2018 (ultra violet). Softer shades of this monster have been popping up in fashion and interior design a lot recently, so you know it's spot on this year. 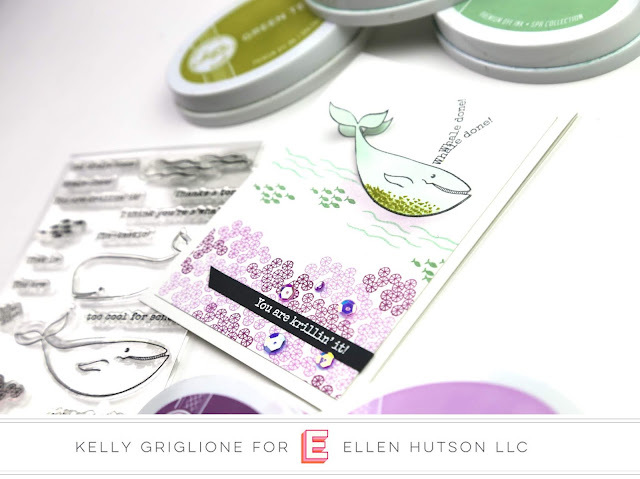 This made it so much more fun to play with a new set I've been dying to try ... Julie Ebersole's hilariously punny and charming S'Whale set. My favorite part of the card came about on accident ... 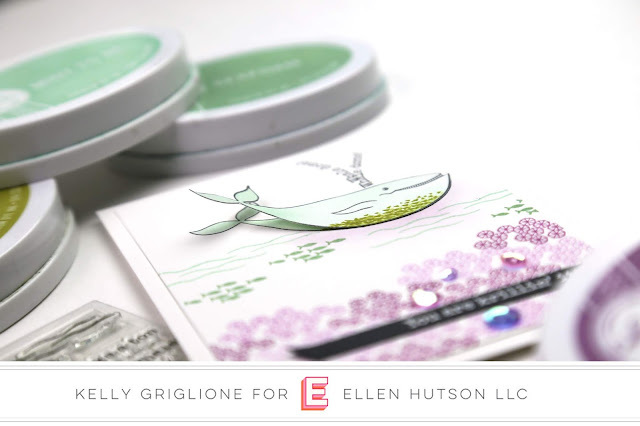 I wasn't happy with how much mint ink I blended onto the whale so I stamped another whale and was just going to layer it on top of the old, darker whale image. Then I thought, since this whale is rising to the surface to blow water out of his blowhole, he's probably using his tail pretty heavily (or maybe not, I'm no marine biologist, hahaha!!) But it seems like he would be, so I curved the whale's tail so that it would give the appearance of a flipping motion when I layered it on top. Which brings me to my second favorite part of the card ... using the "whale done" sentiment for the water coming out of his blowhole! There's a story behind this one too. Hubs was being particularly nice and interested in what I was doing late last night, so he stopped by to see if I needed any ideas. To humor him, I said sure. 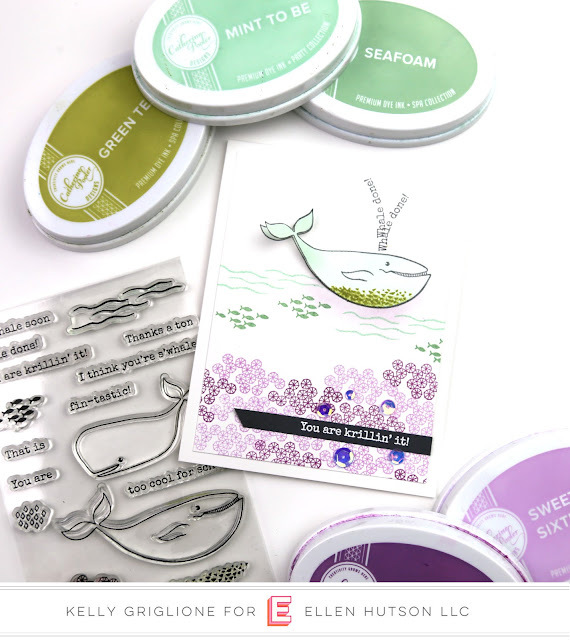 I got several ideas for things that would have been impossible to make with a single stamp set ... like a helpful whale pushing a ship out of the way of an iceberg (how's that for a challenge?!) Or impossible to depict, like a boy whale funneling teeny tiny krill to a girl whale with eyelashes. But one thing he said had to do with blowing water out of a blowhole, and that gave me the idea to use the "whale done" sentiment for the water. I slightly curved the sentiment in two different directions and stamped it where I thought this guy would blow water. I really have to say, participating in the challenge gave me a lot of new energy, and certainly some ideas that I wouldn't have had otherwise. Hope you are able to find some time to play in a challenge soon, even if you haven't in awhile. 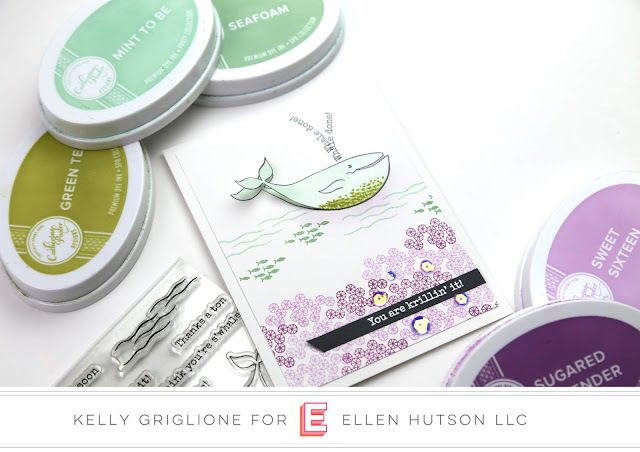 The nice thing about the EH June Color Trends Challenge is that, in addition to being based on this wonderful color scheme, it's open for an entire month, AND a random challenge participant will receive a $50 gift certificate to the Ellen Hutson store! 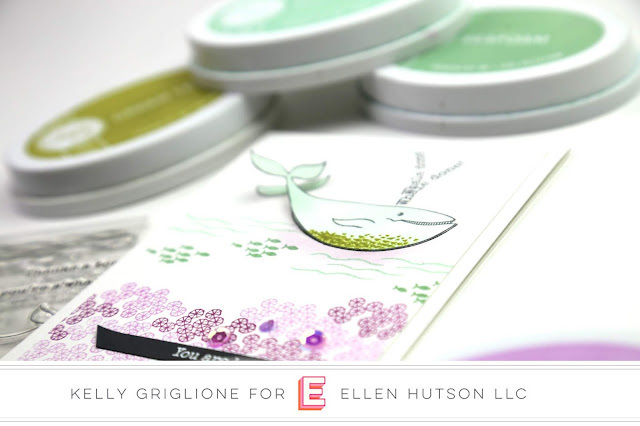 To be eligible, you just need to use Essentials by Ellen products and the photo badge as inspiration. Hello! 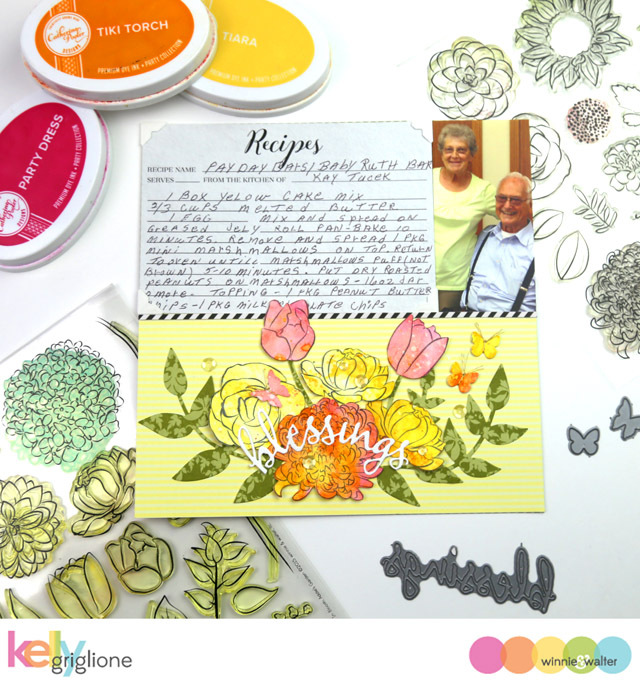 I've got something a little different on the Winnie & Walter blog today ... it's not a card, but a recipe scrapbook page for our family's last cousin to get married. 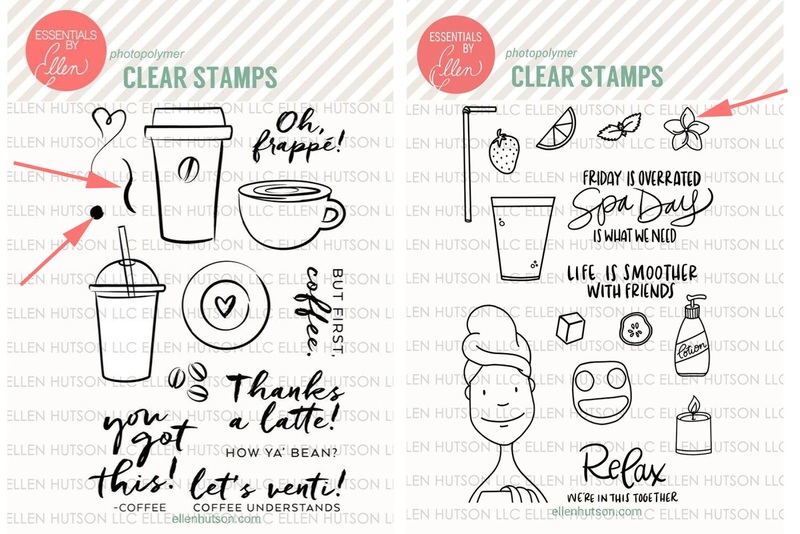 Working with a larger format was a nice change, and really lets you use a ton of these gorgeous stamps we all have. It was fun to just keep layering them on! The other benefit to making these recipe scrapbooks is ... the recipes!! A whole pan of Pay Day bars?! Umm, yes please! If anyone's interested in trying them ... here's a shot of the back of the recipe. 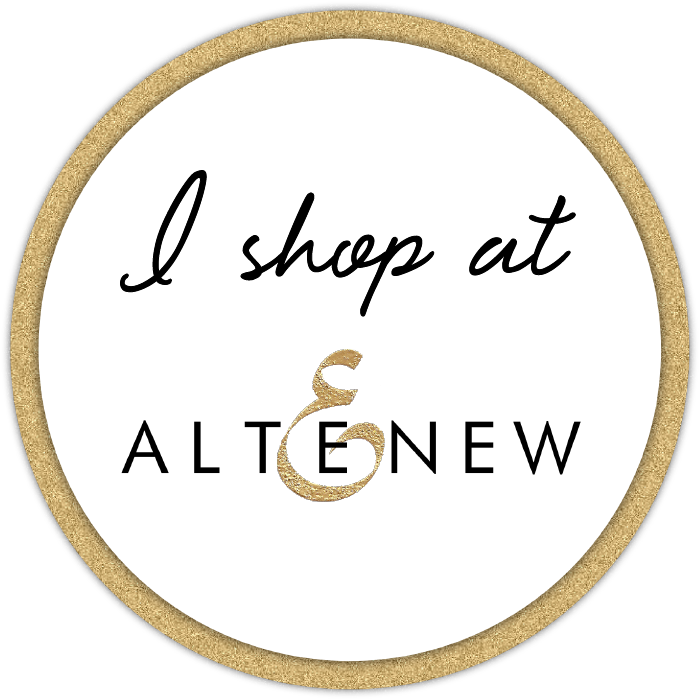 My full post, with photos and tips, is on the Winnie & Walter blog. Hello! Whenever I start a card I usually want to have some sort of challenge involved in making it, like a new technique, a different twist, or maybe combining a few different techniques. For this card, my challenge was to copy the inspiration photo of four vases in the Ellen Hutson June Color Trend Challenge as closely as I could, without having having any EH floral vase stamps. So I spread out the sets I had and started picking out elements that could work. I have a round balloon from Essentials by Ellen Up the Happy that works for the vase if I turn it upside down, as long as I don't ink up the tied section (where the arrow is pointing). The neck of the vase will come from turning the letter "u" from Essentials by Ellen Basic Alpha upside down. The opening of the "u" doesn't have to match the un-inked opening of the balloon exactly since I will be blending ink to color inside the vase. A few stray ink marks won't be too noticeable. The stem of the flower is an elongated "s" shaped squiggle stamp from Oh, Frappe by Julie Ebersole. I really just needed a straight line for the stem, so I stretched out the squiggle stamp on my block and forced it to be more straight. For each of the stems, I just inked up a different length of the stamp. The flower itself was pretty easy, as there was a tiny flower in the Spa Day by Brandi Kincaid set. 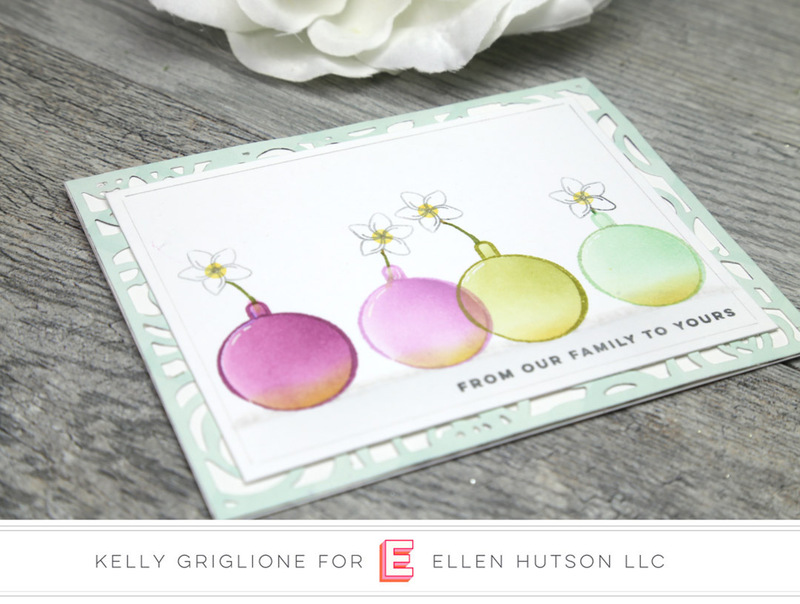 But, I did notice that in the inspiration photo there were tiny yellow centers on the flowers. 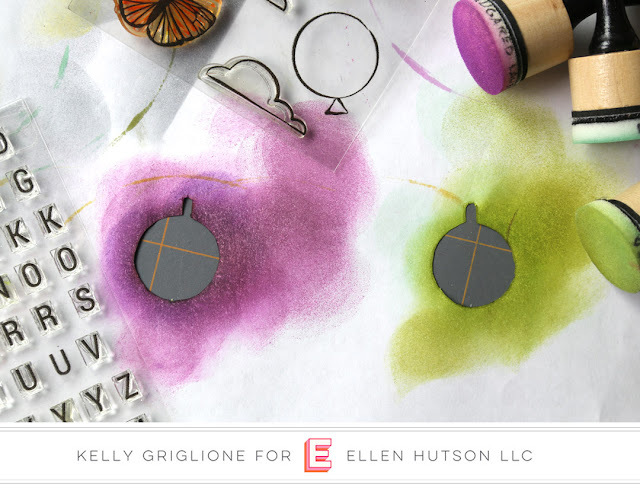 I could have just used the tip of a yellow marker to fill in my centers, but I'd feel better about my personal challenge if I could find a stamp to do this for me. 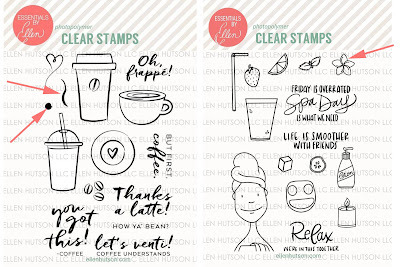 Hunting through my sets again, I found a dot stamp from Oh, Frappe by Julie Ebersole. It was a little larger than I would have liked, but sometimes that's how you get the artsy look ... something's a little off and not how you would have planned it. Now that all the stamps are picked out, it's time to start construction on the vases! I stamped a couple vases on a sheet of copy paper so I could cut out the insides and use that as a mask. TIP: don't be lazy like me and try to use the same mask for all your vases, especially if you're making more than one card. I did this at first and forgot the colors get muddy when you're blending mint ink over a mask that already has purple ink on it. So I made four separate masks, one for each color vase. I blended some black ink to make a surface for the vases to sit. There wasn't a whole lot going on with the vases, so I thought I'd better make an interesting background. It couldn't be too distracting though because I wanted to stay true to the simple nature of the inspiration photo. Usually this means I add texture vs color. 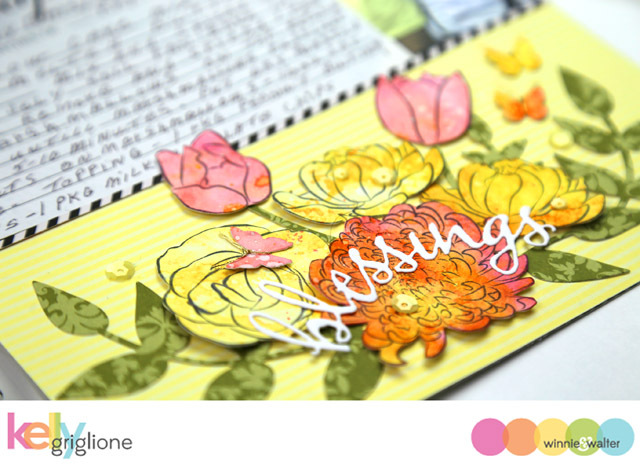 So I die cut the texture-loaded Bed of Roses by Julie Ebersole Cover Plate die and layered that behind my stamped panel. Although I covered the majority of the beautiful die cut, the wavy lines peeking out along the edges of my main panel are just exactly what I was looking for. To finish it off I added a sentiment from Winnie & Walter's Sentimental: Winter set. 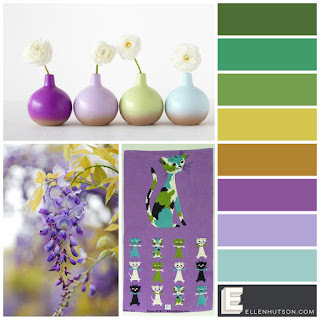 Sure hope you get a chance to play along with the June Color Trend Challenge when it gets posted this Thursday! You have a whole month to dream up something special to share with everyone. 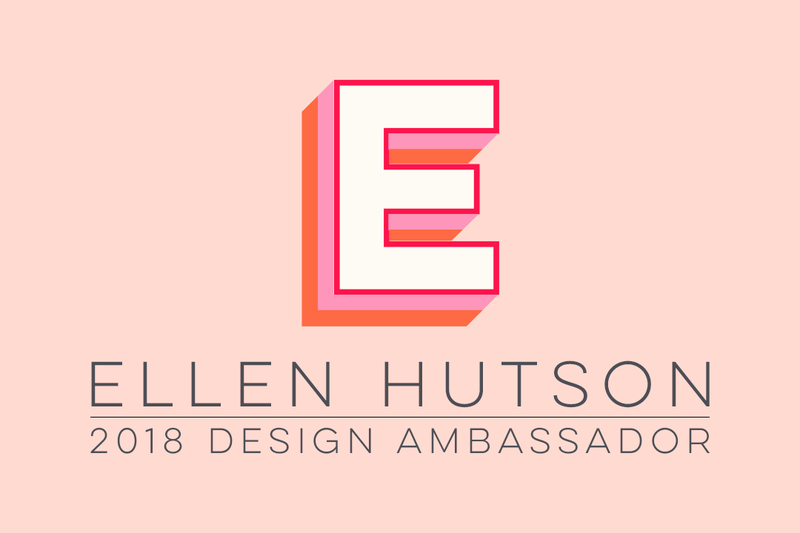 Also, there will be a randomly chosen winner to receive a $50 gift certificate to Ellen Hutson! Hidden Message Card that Lights Up! Hello! 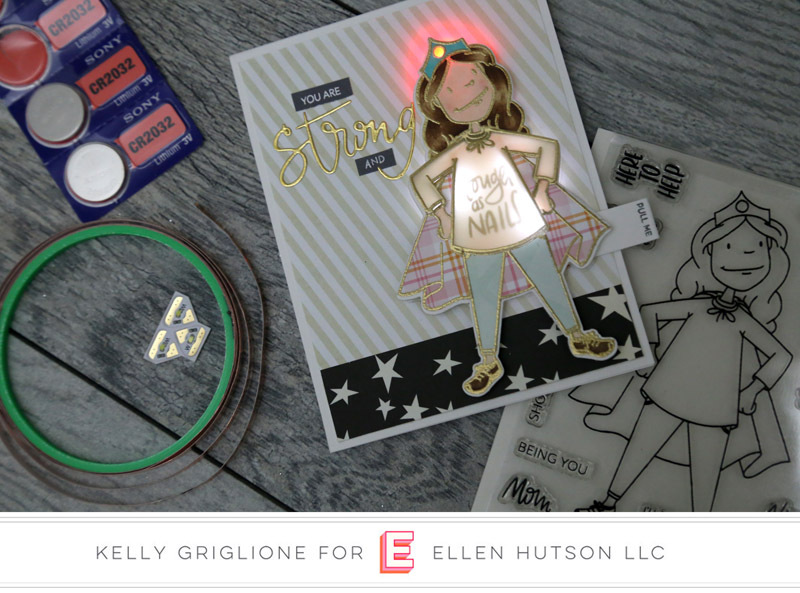 I've got another light up card to share with you, and this one has the added benefit of revealing a hidden message once you pull the tab! 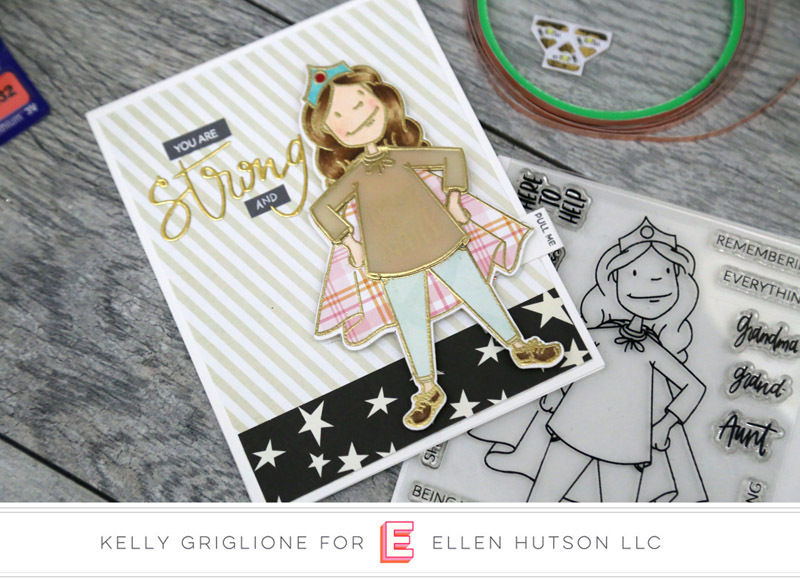 The hero of this card is the Essentials By Ellen Every Day Hero Lady by Brandi Kincaid. 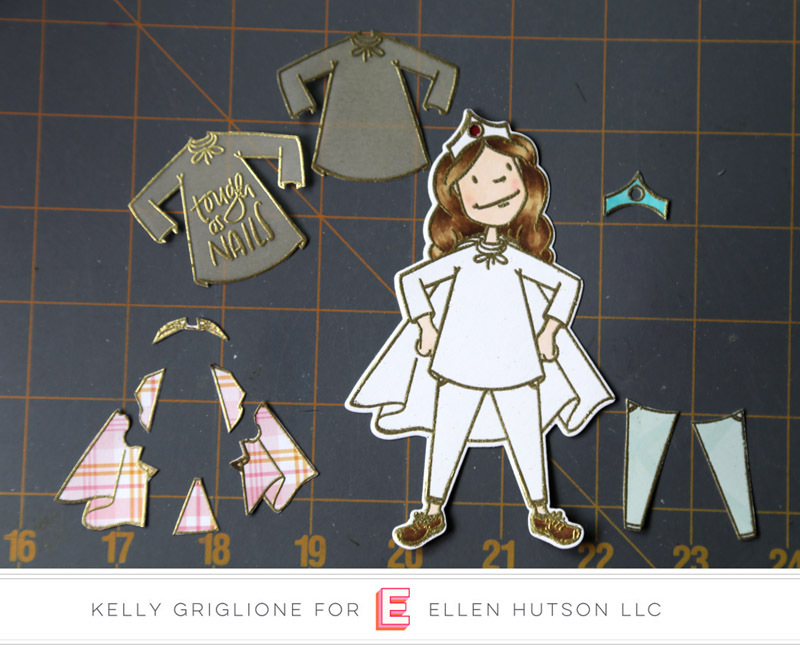 She is sporting a fashion-forward cape, paper pieced with Perfectly Plaid Spring by Lawn Fawn. 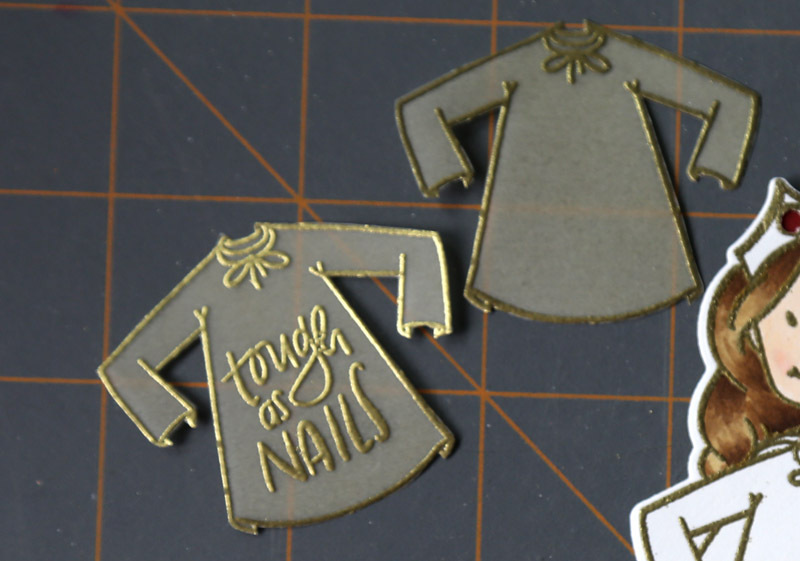 Because we want her shirt to light up, it's stamped, embossed and cut from vellum. There is a hole punched out of the crown so her gem can light up as well, and it will be backed with red vellum. Her hair is colored with the only three brown copic markers I have, hahaha! Because we want the message hidden until the light goes on, I made two shirts. The plain one will be on top of the one with the sentiment, hiding it until show time. 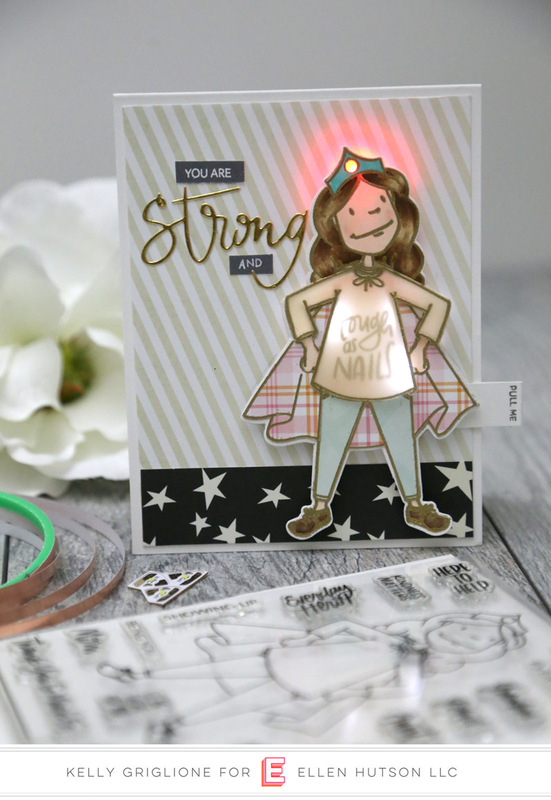 I was so excited to find that the "tough as nails" sentiment from the Essentials by Ellen Make it Beautiful set by Brandi Kincaid fit the shirt EXACTLY (space wise and content wise)! Doesn't this look like it's from the same set?! 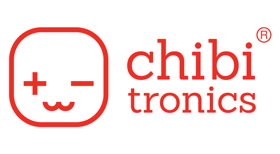 You can find all the nitty-gritty details on the mechanics of the card by checking out my article on the Chibitronics blog. But, I'd like to point out one interesting feature, and that's in the center of this circuit, where the black arrow is pointing. 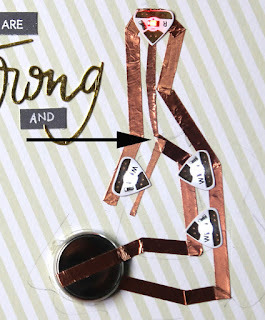 After the second LED the copper tape on the negative side (the narrow tips of the triangle) splits into two. Due to the small space involved in hiding all the circuitry under the Every Day Hero Lady I didn't have room to run the copper tape up to the red light and then back down again to the last light, so I cut down the middle of the copper tape and ran one end to the red light and the other end to the last light. Problem solved! Here she is, looking all confident and ready for action. The sentiment "you are" is actually a portion of one of the sentiments from the Cat Lady set by Brandi Kincaid. I just wrote "and" with a white gel pen. The "strong" die cut is Strong by Brandi Kincaid, which looks fabulous in gold foil with its thin lines. I seem to use this die all the time recently. So, shall we see what this lovely Leading Lady can do? Ta-da! The rest of the message is revealed ... "you are Strong and Tough as Nails." And if you had any doubt this lady has super powers, the gem in her crown lights up. She is a force! The "pull me" on the sliding tab is from Heffy Doodle's Interactively Yours set. It's the perfect size ... not too big to draw a ton of attention, but you know it's there asking you to do something. And it fits the width of the tab perfectly. Here's a video showing this lady in action! Thanks so much for stopping by today! I hope you enjoyed this interactive card!